Sandy has been painting as a hobby for many years. A perfectionist as heart, she rarely considers a piece “finished”, merely done. An impressionist, she is influenced primarily by Manet in her more realistic depiction of human subjects and Monet in nature compositions and her beloved Christmas scenes. Growing up on a berry and later a Christmas Tree farm in Wausau, WI she’s always had a penchant for painting nature scenes, but is equally capable when depicting structures and the abstract. 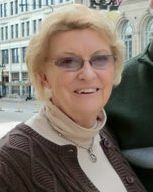 Sandy lives in Germantown, WI with her husband Bob. Her three children currently live in Madison, Milwaukee and Chicago, but her oldest daughter will soon be moving to Rome, Italy.